Brugal is a rum distillery in the Dominican Republic founded in 1888 by Don Andres Brugal. Nowadays the fifth generation is leading the company that bottles a variety (of mostly seven) rums. 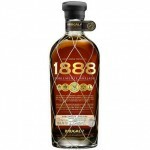 The Brugal 1888 Ron Gran Reserva is a matured rum from the Dominican Republic. This Brugal 188 ma..